It's a staggering coincidence that 31 Down's "Here at Home" began performances only a week after news of the actions of America's military flooded our culture. 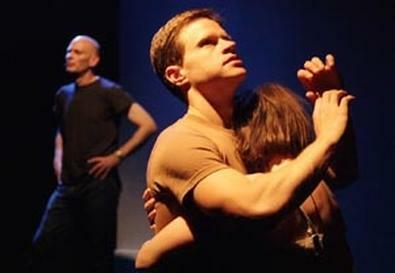 Directed by Shannon Sindelar and with text by Eric Bland, this anxious play addresses the civilian mindset during wartime impressionistically. Ryan Holsopple's pixelated projections and thundering combat soundscape tease out the coarse, digital texture of war as experienced through media. After days of watching the low-fidelity videos released after Osama bin Laden's death, this smartly styled multimedia piece feels almost cosmically in sync and relevant. Bland's abstract, darkly funny script centers on three civilians, each with an obsessive connection to America's wars in the Middle East: Holly, who pines for her currently serving boyfriend; Frank, a veteran of the first Persian Gulf war; and Mike, the brother of Holly's boyfriend and determined to join him in combat despite a bad eye and frequently antisocial behavior. Wal-Mart co-workers Holly and Frank mostly talk about how long it's been since they quit smoking or engage in other meaningless chitchat to keep her from thinking about her absent lover. She does inevitably think about him, deeply, and we occasionally hear her meandering thoughts on the cost of war through a prerecorded voiceover— a trick that heightens the play's sense of detachment without being overbearing. Only a tedious video segment featuring footage of suburban streets and a peculiar bit of Victorian cross-dressing threatens to capsize the otherwise well-balanced tone. Hollis Witherspoon, D.J. Mendel, and Holsopple are adept throughout as Holly, Frank, and Mike, respectively, but Holsopple's immersive use of media is the real star. As Holly listens awkwardly to Mike's opening voiceover, for instance, she is lit by small, continuously scratched-out white spotlights in the otherwise dark projection. This striking effect mirrors her efforts to claw her way out of a depressing routine. In another stunning scene, Holly is followed by multiple digital shadows of herself, echoes made of multicolored sprites that replay her frantic motions as she mulls over what is worth dying for and what isn't. Presented by the Bushwick Starr and 31 Down at the Bushwick Starr, 207 Starr St., Brooklyn, N.Y. May 12–28. Thu.–Sat., 8 p.m. (718) 306-2370 or www.brownpapertickets.com.